Socialcam was discontinued and taken offline in October of 2015. We've left the following article for information purposes. Video and mobile are huge these days, and when you put them together it gets even better. YouTube is probably the most popular video platform, but smaller ones that focus more on user interaction have started popping up more and more—one of which was called Socialcam. From the creators of Justin.tv, Socialcam was a mobile app that allowed users to easily capture and share new videos. You could customize your videos using Socialcam’s built-in editor with vintage video filters, custom titles and sound clips. If you’re already familiar with Instagram, you’d have probably noticed a lot of similarities with the layout of Socialcam, only exclusively with video posts. There was a menu at the bottom of the screen so you could navigate between the main tabs—just like Instagram. Here is a breakdown of the main features Socialcam offered. Video feed: See all the videos and activity of users you were following, similar to Instagram’s photo feed. Popular: See at what videos were getting the most likes and comments. Friends: See a list of the users that were your friends on Socialcam. Activity: See a summary of who had followed you and liked or commented on your videos. Unlimited video recording: Socialcam didn't give you a limit to length. Cloud storage: All videos were uploaded fast and stored in the cloud, so you could delete them off your phone without needing to worry about storage limitations. Privacy: You were in complete control of who you wanted to see your videos and you could customize each video so it was private or public. Editing: You could apply vintage and experimental filters to your videos, create titles, or choose any of Socialcam’s soundtrack effects to play in the background. Social Integration: You could easily share any of your videos on Facebook, Twitter, YouTube, via Email or through SMS text messaging. Notifications: When another user liked or commented on one of your videos, you were notified immediately. Fast uploads: Videos were uploaded very fast in the background without any spinners, and you could upload pre-recorded video from your Cameraroll as well. After downloading it from iTunes or from Google Play to your iPhone or Android device, Socialcam would have asked you to create a new account by signing up through email or by connecting through you existing Facebook or Twitter account. Socialcam would then pull up a list of recommended users that you could immediately start following if you’ were interested. After that, you could start recording videos. A button in the center of the bottom menu activated Socialcam’s camera. You could then switch between the front and back camera before pressing the record button to start recording. Once you pressed the stop button, Socialcam would ask you to type in a title and choose your privacy settings you wanted on the video. You could choose a theme and background music before tagging the post with people you know and sending the finished video to people through email (or posting it to social networking sites). I liked that Socialcam allows unlimited video lengths. 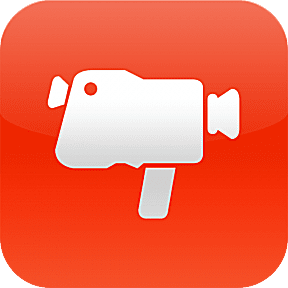 The 15 seconds that Viddy capped its videos at wasn't a very long time, so Socialcam was a great option for people who wanted to share longer videos. Personally, I did like the darker layout of Viddy better than Socialcam’s. The video feed looked a little bit messy, and I headr that the Android app hadn't been updated in some time so I assume it wouldn’t work very well on my Android. Overall, Socialcam was extremely easy to use. I loved that you were asked after every video to choose your privacy settings and whether or not you wanted to share it on social media sites.